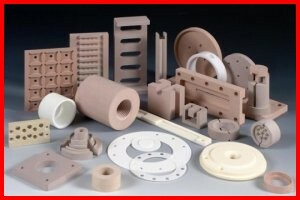 CerMax is a broad range of machinable and fully-dense ceramic materials, providing high temperature insulation, thermal shock resistance and high dielectric strength. Includes compositions based on alumina, alumino-silicates, boron nitride, glass-ceramics, magnesium oxide and zirconium phosphate. Production capabilities include isostatic and dry pressing, low pressure injection molding, extrusion, slip-casting, and CNC machining. Cermaic bulk material can be machined into shapes such as plugs, gaskets, sleeves, cups.